Brent oil prices increased by 2.10% or US$1.46, as prices increased this week relative to the prior week. Oil traded on April 11, 2019 at a price of US$70.86 per barrel relative to US$69.40 on April 04, 2019. Brent oil began the year at US$54.91 per barrel. 87 Octane prices increased this week by 1.74% (JMD$2.28). Additionally, 90 Octane increased by 1.70% or (JMD$2.28) this week. 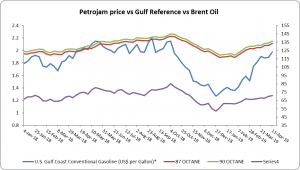 87 Octane and 90 Octane opened the year at J$116.75 and J$119.59 respectively nd now trades at J$133.46 and J$136.30 per litre respectively. There was an increase in U.S. propane/propylene stocks last week by 1.2 million barrels to 54.4 million barrels as of April 05, 2019. This was 9.0 million barrels (19.9%) higher than the five-year (2014-2018) average inventory level year over year. Additionally, Gulf Coast inventories increased by 0.8 million barrels, and Midwest and East Coast inventories each increased by 0.2 million barrels. Rocky Mountain/West Coast inventories declined slightly, remaining unchanged. Propylene non-fuel-use inventories represented 11.5% of total propane/propylene inventories.